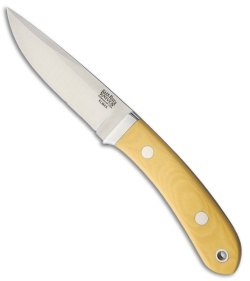 This Blackwater II knife sports a Antique Ivory Canvas Micarta handle and an Elmax steel blade. The Blackwater II from Bark River Knives fills the role of a hunting, backpacking, or bushcraft knife. This all-round fixed blade is designed with superb handle ergonomics for a secure grip that provides total control over the blade. A partial swedge creates a finer tip for any delicate work you may encounter. Includes a handcrafted leather belt sheath.